Music has always been an important part of my life. From the time I was very small, I loved to sing and would sit with my mom on the piano bench, singing every song I knew while she played for me. To this day, I LOVE to sing. I’m also the student who had learning disabilities all the way through school. It wasn’t until I was in 12th grade that we had an answer to why school came so hard…I have dyslexia. As a child and teen, I struggled constantly with reading, math and science. I can remember being in 2nd grade and praying that my teacher would not call on me to read out loud, because I was just terrible at it. However, no matter how hard reading was, or math or science or algebra (which, let’s be honest, I haven’t used since finishing the class), I had music and I KNEW that was one area that I excelled. Music gave me an appropriate way to express myself when I wanted to scream in frustration, throw my books or hit something (okay, someone). Music provided me a means of appropriate self-expression and offered me with opportunities to develop my creativity, which allowed me to think outside the box. Academically, music was my anchor. It taught me perseverance, individualized self belief and an overall discipline that not only allowed me to graduate from high school 2nd in my class, but go to college, receive a bachelor’s degree, then return to complete a master’s degree. The academic benefits I gained from musical study were a very important part of my success in high school, college and graduate school. 5 Academic Benefits of Musical Study. Studying music sharpens concentration, teaches perseverance, and creates better study habits. Studying music increases listening skills, the ability to pick out important auditory signals and effectively filter out distracting noise. Studying music improves reading and vocabulary skills. Studying music strengthens the same part of the brain used in complex math skills. Studying music has been shown to demonstrate increases verbal intelligence in preschool children. If you want to know more about the benefits of musical study, please like our Facebook page at www.facebook.com/desertsoundsofwellness and follow us on this blog, as we will be visiting other music related topics in the future. If you are interested in studying music, please visit our website at www.desertsoundsofwellness and read about the music instruction opportunities that we offer to students in the Phoenix Metro area. I set my next piece on the stand and glanced up at the timer sitting on top of the piano. “Just 15 more minutes, just 15 more minutes, just 15 more…” I thought to myself, before reaching up and moving the timer down 5 minutes, “Just 10 more minutes.” I chanted to myself. After playing through my piece, I again glanced up at the time, “7 more minutes…” a sigh escaped. Playing through my assignments one last time, I wondered how 30 minutes, with just a little adjustment, could take so long. Leaping from the bench as the timer dinged, I heard my mother. “5 more minutes.” She called from the kitchen. “But, it dinged.” I called back with some annoyance. “5 more minutes.” I sighed again and sat down again. Never could get anything by her. Practicing can be challenge for any student studying music and any parent helping a student study music. However, practicing doesn’t have to be a complete drudgery. Here are 5 tips for making practice both beneficial and fun. 2. Make the student’s practice time a bonding time. Parents with young students have the opportunity to make a student’s practice time into a “quality time” activity. By working towards a common goal together, such as completing a piece or preparing for a recital, a unique opportunity is created for both the parent and child. 3. Include musical games during practice times. Parents working with their students can turn up the “fun” factor by including musical games. 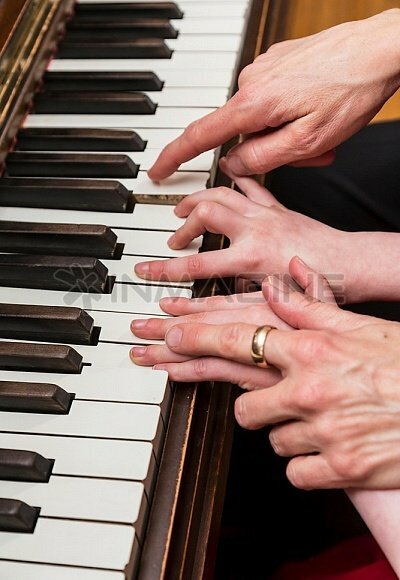 Musical “Concentration” can work on either note identification or rhythm. Games like” Measure Up!” work on rhythms in a variety of time signatures. “Dominotes” works on recognizing values of notes and rests. There are many ready made musical games that can be purchased and for those creative parents, numerous games can be developed to learn various music concepts. 4. Establish a set practice time each day and honor it. Once establishing a time to practice, stick to it. Keep distraction and noise to a minimum during practice times. 5. Be free with the praise. Find something to praise and compliment about each practice. Focus on the positive and the improvements the student has made during the practice. A “Good Job!” can go a long way with a child and make him or her more willing to continue working toward the goal…to play the piece well. Music has been a big part of my life since I was very small. I remember sitting on the piano bench next to my mom, singing my heart out and loving every minute of it. I remember starting piano lessons at the age of six and clarinet lessons at the age of eight and finally, voice lessons at the age of thirteen. During grade school, I also studied recorder and saxophone, and during high school, I studied the snare and tympani drums. My favorite, of course, was voice. I loved, and still love, to sing and act. I remember as a child dreaming of singing the part of Maria in “The Sound of Music” and as a teenager, wanting so badly to sing the part of Christine in Andrew Lloyd Webber’s “Phantom of the Opera” (although the part of Madam Giry was in my vocal range as a mezzo-soprano). Beside the “fun” element, the benefits of musical study are numerous. Today, research has established these benefits in the areas of academics, creativity, brain development and mental longevity. Research has now established that among people who studied a musical instrument for 10 consecutive years, fewer cases of Alzheimer’s disease develop. With so many research studies available, we could devote pages and pages to the benefits of musical study, but today, we want to share just five of those benefits with you.